Charity Doctors of the World UK has launched alternative Christmas cards showing traditional Biblical nativity scenes interrupted with images of modern wars in the Middle East. 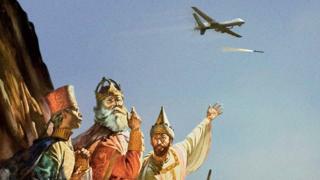 One of the four designs shows the Three Wise Men pointing to the skies as a drone flies overhead. The charity is selling the packs to raise funds for its healthcare work across the region. Social media users shared the images with the hashtag #realityxmas. "We've launched this campaign in the first week of Advent to shine a light on the realities of life in the Middle East at Christmas," said Executive Director Leigh Daynes. "We want to provoke a broad public debate about the effect of the conflict on ordinary people at the time of year when many of us are thinking of loved ones, peace and goodwill." Another image showed Biblical figures Joseph and Mary seemingly looking for a place to stay surrounded by bombed-out buildings. The idea came from advertising agency McCann London, who approached the charity and offered to design the cards pro bono. The charity said it was considering another print run after selling a quarter of the 400 packs within 24 hours. Doctors of the World was founded in France in 1980, but now has 15 offices around the world, including two Middle Eastern hubs in Jordan and Lebanon. The organisation carries out work with medics, midwives and psychologists across Syria, Iraq, Lebanon and Turkey. Mr Daynes said the peaceful pastoral images usually shared on Christmas cards were at odds with the humanitarian crises on the ground in the Middle East today. "The scale of the devastation in Syria is hard to comprehend. The country's health system has been brought to its knees," said Mr Daynes. In over five years of conflict in Syria, more than a quarter of a million people have been killed. In areas of heavy fighting, many hospitals and healthcare centres have been closed or are only partially operational.